How do we use technology in ways that will create not just prosperity, but shared prosperity? In March 2004, a comedy of errors unfolded in the Mojave Desert. A million-dollar prize was on offer via the DARPA Grand Challenge for any self-driving car that could complete a 240km course. The best performer didn’t even make it 12km before coming off the road at a hairpin turn and getting stuck on an embankment. One of the 15 entrants managed to flip itself upside down itself before it even left the starting gate. It’s amazing to think that, in barely more than a decade, we’ve gone from the Keystone Cops to self-driving cars safely navigating the streets of many cities. A big part of that story is the amazing power of simply setting a clear goal and attaching a prize to it. I remember how graduate students and professors on the MIT team became so engrossed in the DARPA Grand Challenge, they forgot to eat and sleep. Humans can be incredibly dedicated and successful when we have a target in mind. Today, the main conversation about self-driving cars is not about technological feasibility, but societal impacts and industrial transformation: How difficult will it be for the taxi drivers and truckers who’ll lose their jobs to find another way of making a living? How will the industry change if we stop thinking about cars as things we own continuously but only use 5% of the time, and start seeing them as an on-demand service? How much can we reduce accidents, pollution and congestion? I don’t agree with either of these views. 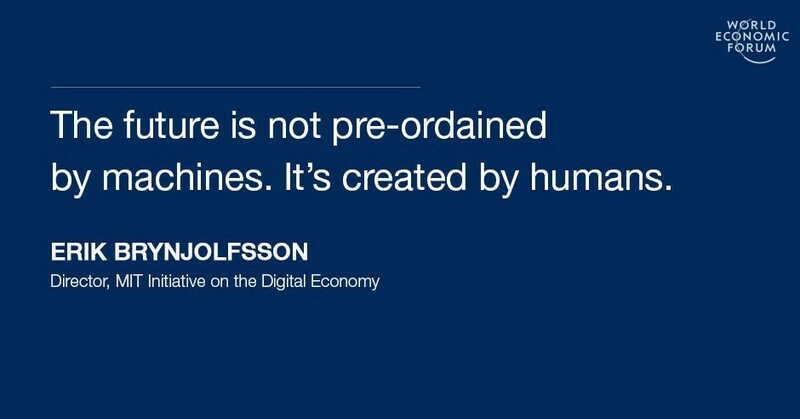 The future is not pre-ordained by machines. It’s created by humans. Technology is a tool. We can use it in many different ways. How do we use technology in ways that will create not just prosperity, but shared prosperity? How do we make choices that will work for people earning low and middle incomes? Here’s part of the answer: Let’s define the goal and offer a million dollars in prizes. Let’s create a new grand challenge. At the MIT Initiative on the Digital Economy, which I co-founded with Andy McAfee, we came up with the idea of the Inclusive Innovation Challenge. Many prizes already exist to motivate engineers to create amazing technologies. That’s terrific. But why not develop a prize to inspire business executives and social scientists to think up better ways of using these amazing technologies? We defined four areas where we think leadership from the private sector will help use technology to benefit the many, not just the few. 1. How do we enable people to succeed in and access the work opportunities of the future? 2. How do we connect more people with internet and technology access, regardless of age, location, education, or ability? 3. How do we ensure financial security and stability for more people? How do we enable more people to access the benefits of financial services? 4. How do we ensure that workers earn sufficient and growing incomes to achieve satisfactory quality of life and living standards? How do we reimagine struggling industries and create new opportunities for work? We raised prize money from individuals like Eric and Wendy Schmidt, Brad Feld and Amy Batchelor and Joe Eastin, from The Joyce Foundation and The Rockefeller Foundation, the NASDAQ Foundation, and from Accenture Digital, and many others. We recruited a panel of expert judges. We received over 250 entries. The applications were incredibly impressive. A few months ago we announced the first year’s winners. They included a company called 99Degrees Custom, which is bringing manufacturing jobs back to Lowell, Massachusetts. That’s only about 30 miles from the MIT campus, but it’s a very different kind of place – a city built on the textile industry, where the working class have been hard hit by jobs being automated and moving offshore. Those old jobs are never coming back. But we can create new manufacturing jobs, with cutting-edge technologies like the ones the workers at 99Degrees Custom are using to make highly customized textile products. These jobs are better than the old factory jobs – more interesting and better paying – and they provide workers with transferable advanced manufacturing skills. Another winner was Iora Health. They employ health coaches and match them with patients to work on simple things like helping the patient to stick to a diet their doctor recommended, or an exercise regime, or just to remember to take their pills. Studies show that this approach can improve outcomes and reduce costs by 15-20%, making the difference between a patient recovering or incurring the expense of another stay in hospital. These coaches aren’t trained medical staff, and they’re at the lower end of the income scale. But they’re adding real value by using the kind of human skills we won’t get from robots any time soon, if ever – empathy, motivational skills, emotional intelligence. Of course, spreading the benefits from technology demands leadership from governments, too – in areas like education, infrastructure, regulations, taxes and social protection – as well as individuals taking responsibility for developing their skills. But these are great examples of how leadership in the private sector can help to shape the way technology remakes society. The changes won’t happen overnight. In the first industrial revolution, it took several decades after the invention of the steam engine for societal changes to play out. After electricity became widely available, it still took about another three decades for industrialists to fully rethink their factories, business models and organisational structures to take advantage. Similarly, the social impacts of many of today’s emerging technologies are likely to take several decades to shake out – from self-driving cars to healthcare to manufacturing to financial services. In many industries, we are now at a leverage point in rethinking how we do things. The choices we make now will, in a very literal sense, shape the future. So I want to encourage everyone reading this post to think about the kind of world you want technology to create. Realize that your vision won’t happen automatically. What can you do? Why not join us in creating widely shared prosperity? Perhaps get involved with the next round of the Inclusive Innovation Challenge. Or define your own personal grand challenge.